Happy Monday friends! Hope you've all had a lovely weekend? I had a productive one cracking on with some blocks for my much neglected Farmers Wife quilt! More on that in another post ;) Today I wanted to share a new Swoon block mini I finished up recently! I have to say, I couldn't be happier with how this turned out. Honestly I think this is one of my most favourite things I've made. Really. I completely fell in love making the Swoon block (by Thimbleblossoms, you can find it here) it was such a pleasure to piece. I'm not so accurate with teeny tiny piecing, so I throughly enjoyed working with such a big block. I hadn't actually realised quite how BIG the Swoon blocks were until I finished it up and held it next to me! The fabrics are Liberty Tana Lawns, they really are so beautiful! (thoughts on stocking them for my Sew and Quilt shop?) You really get to see the fabrics with this design so I think it shows them off well. I use Kona Snow for the background, and le creme swiss dot in cream for binding, so as not to distract - I seem to favour a neutral binding in my projects, I think? oh this is so so darling! love it! and your house looks so pretty! 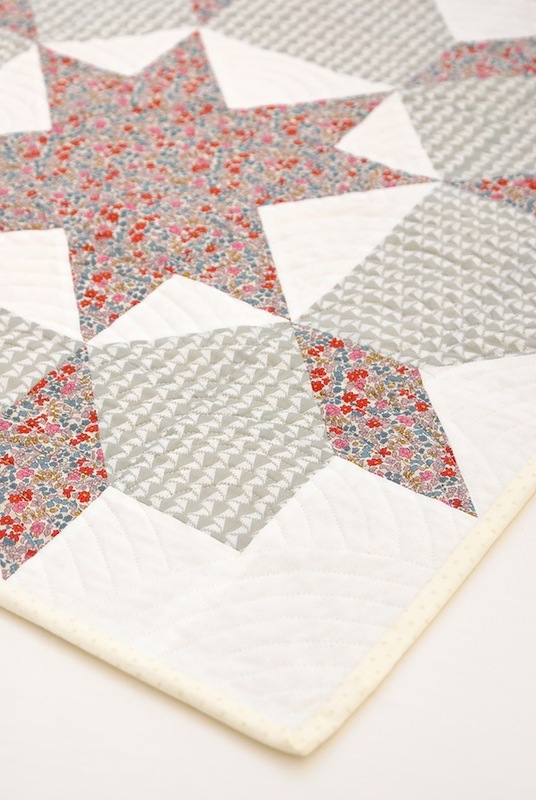 Love this block and your fabrics are gorgeous! That is a lovely wall hanging. Well done! 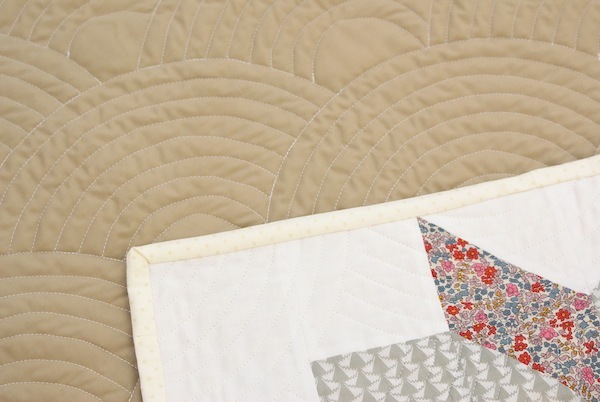 I love the swoon block and your version is stunning. 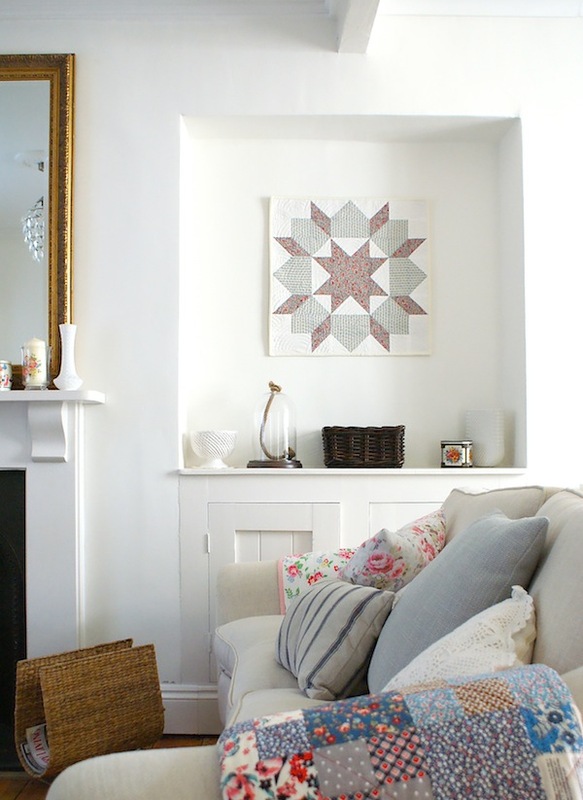 It looks just perfect hung in that alcove in your house. So nice! Love it. 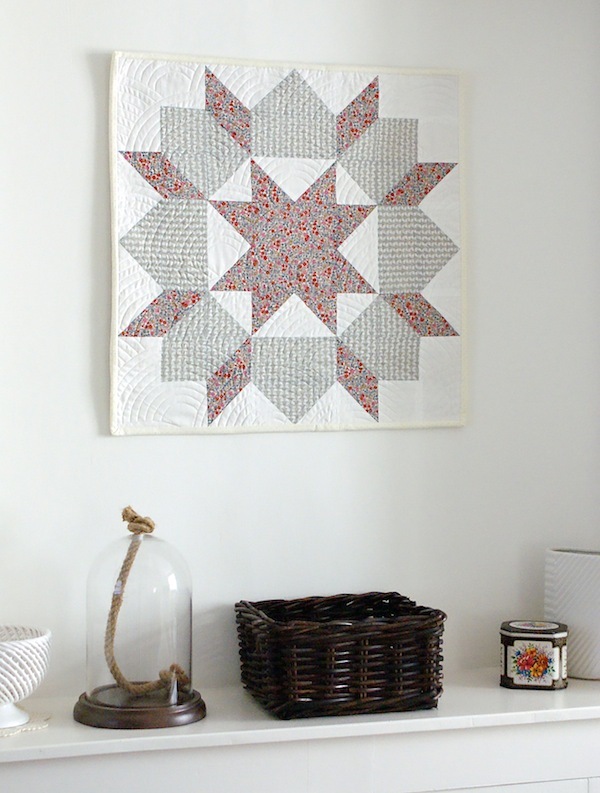 I'm planning a swoon quilt myself and hope to be able to start on it soon. Loving all the Mini's you've finished lately! I've managed to complete 3 swoon blocks & then got sidetracked by other things, now i'm thinking I should just make them into 3 mini's! Thanks for the inspiration. I purchased the pattern yesterday!! So pretty... and oooo yes to stocking liberty tana lawn!